This image is from a decade earlier using Stockmar watercolor paints on thick paper. I have tried to meditate on this Image off and on for quite some time. My experience, working with this image has taught me more about my own inner state than anything else. When in a conversation with Maria St. Goar I remember her saying that, for her, one of the roses kept flying or floating off; this is a paraphrase but the jist of the conversation stayed with me. My use of color in art is a step beyond what I actually experience inwardly on a regular basis. That is not to say I don’t have an active inner life or even some inner experiences of color, but there is a kind of leap I have to make in inner visualization to the outer artistic form. I am seeing through the darkness as though in complete void to perceive anything. It is the intuitive aspect of visual experience that I experience inwardly, the thought and feeling. I can ascribe direction and project geometrically into inner space. I intuit meaning first not stable static form of image, or even living image, except that it can never seem to be pinned down and is in constant motion. 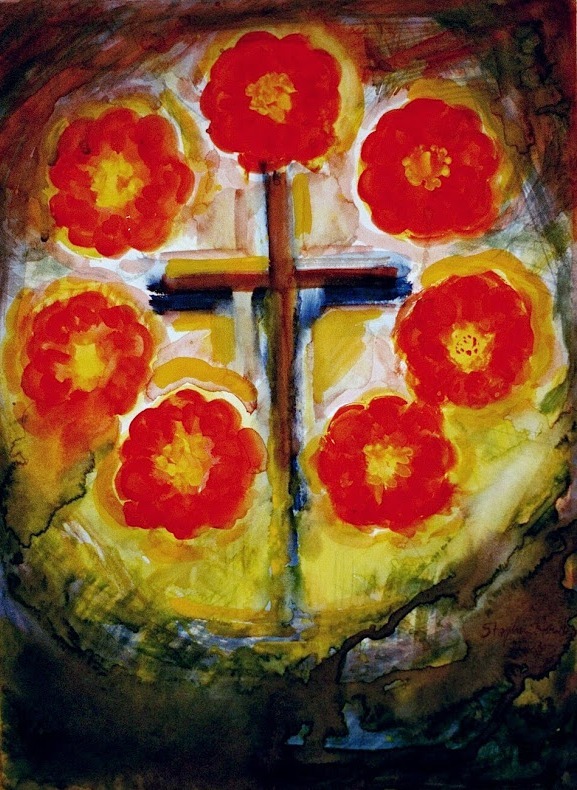 When trying to meditate on the image of the rose cross, it is much more difficult than simply having one flower not want to conform to a patterned circle. Sometimes I join an earlier study with this meditation just to alleviate some of my frustration with the long, though persistent task of realization and revelation. 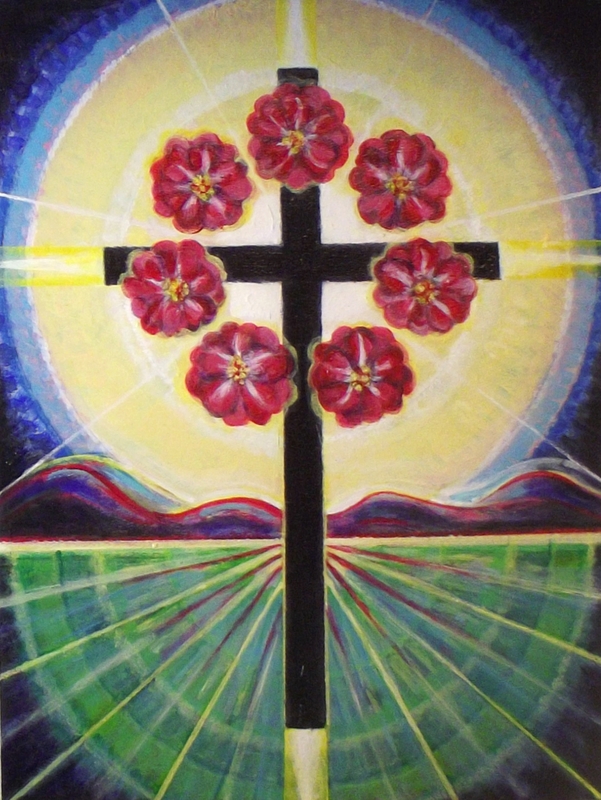 I connect each rose through the seven pointed star. One of the things that I found fascinating about the mathematical relationship when trying to determine seven equidistant points on a perfect circle was how the numbers looked in relation to each other. It seemed you could only approximate the degree on the circles curve. You could of course describe the point mathematically but had to make an approximate choice when actually marking it on the circle, or so it seemed to me. You could approximate in both directions and split the minute difference. This also seemed to me to come down finally to a choice. Another interesting phenomenon to me was the numerical relationship that the approximations had to each other, recycling numbers in a regular repeating pattern adjusted for each point. Copies of the images? Which one?The earliest one at the bottom is posted on Fine art America and I will post the others there as well, where prints can be purchased. That is a personal web site. I try to keep this site, Art and Anthroposophy, noncommercial. Inquires about the originals, of which I only have the bottom 2, or commissions, please e-mail me at hawksstephen@gmail.com. Anyone may use these images for noncommercial use. Please give credit and contact me if you are interested in these images.